Edisto is like stepping back in time. An enclave that's been carefully protected from the shifting winds of storms, from the swirls of commercial trends & fashions that come and go. She is sweetly isolated by miles of salt marsh & wide rivers. Pristine creeks that clearly reflect the sky and the clouds. She's an island with a strong sense of self-esteem. A place that doesn't look like everywhere else. Edisto's its own unique spot on planet earth. 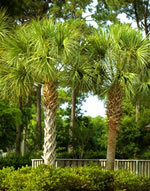 Sullivan's Island, SC is rooted in history. Over the centuries many things have happened along its beaches, where homes and buildings are set safely back behind expanses of tropical flora. It was no accident. Being situated right at the opening of Charleston harbor, "where the Cooper and Ashley Rivers join to form the Atlantic Ocean," history was bound to come knocking. And indeed it did. Witness Fort Moultrie, which survived and served through all the major wars. A visit here is like an entire crash course in American military history. A place of old rice plantations and marshlands that still exudes a natural sense of peace and quiet. A place that draws some very interesting people. Like, the Huntingtons. Archer and Anna knew a good thing when they saw it -- way back when, in the early 30's. Here they found the perfect place to plant, and be inspired. And create one of the most extensive and impressive outdoor sculpture gardens in America. Brookgreen Gardens, a non-profit institution. One of America's undiscovered gems.